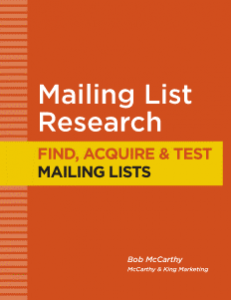 Here are articles written by Bob McCarthy that have appeared in the McCarthy & King Marketing newsletter, blog and other industry media. 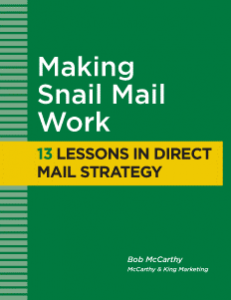 Direct Mail Strategy: Do you see direct mail more as advertising or sales? 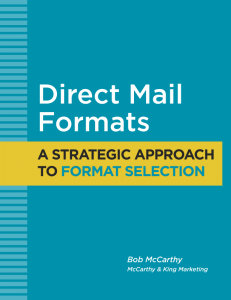 Direct Mail Postcards – Which side is UP? Are you using lead magnets? Copywriting - Do you edit while you write? How important is the response rate? Branding vs. 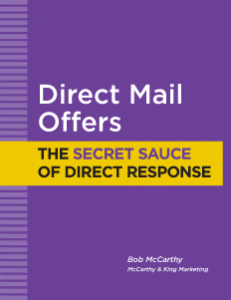 Direct Response: Are you kidding? Will a photograph improve your response? Should you use industry jargon in B-to-B marketing? Lead Nurturing: What happens AFTER the lead comes in? Writing Headlines: Do you make these mistakes in English? Direct Mail Testing. Remove all the guesswork. Never feel bad about "cold calling"
Is your marketing automated yet? How many people on your email list actually buy what you sell? Are you still using reply cards? Isn’t all marketing both outbound AND inbound? Should we believe those response rates? What is the most important thing in advertising? What is junk mail, anyway? Does your email lead nurturing leave your prospects running in circles? If you're using Google Adwords, what happens AFTER the click? What's wrong with interruption marketing? Lead Generation: How do you define a sales lead? Outbound Marketing: How much do you pay for a sales call?